View More In Targets & Accessories. 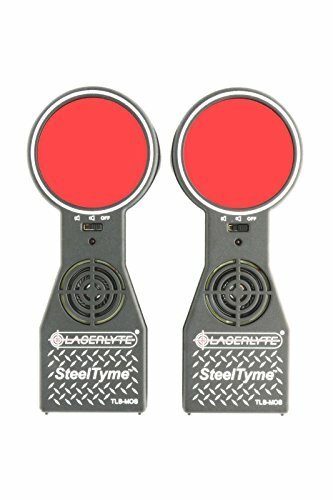 When you hit the target with a laser trainer, it will light up and give you the sound of plinking steel. The round target will give you a challenge to hit, but rewarded with LED lights and the sound of hitting a steel plate. The sound can be muted and only the LED lights will flash when it is hit. Place the target on any flat surface and practice shooting them randomly at different ranges and locations. The Steel Tyme lets you know when it is hit with a celebration of lights and sound. The virtual target will not need to be replaced; you will only need to change the batteries after a few thousand shots. Train at home with the comfort of your favorite couch and air conditioning. Save time on trips to the range. Save money on ammo and gas. If you have any questions about this product by LaserLyte, contact us by completing and submitting the form below. If you are looking for a specif part number, please include it with your message.